The 2016 Citywide Youth Track and Field meet was a huge success. 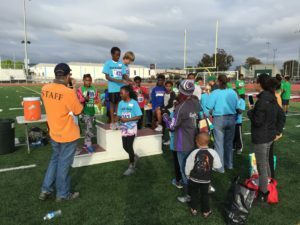 12 schools representing local elementary and middle schools sent hundreds of students who ran, jumped and threw their way to fitness, health and victory. Thanks to the many volunteers, teachers/coaches, parents and kids who helped make these such a wonderful event. And a special thanks to our sponsors. We couldn’t do it without you! 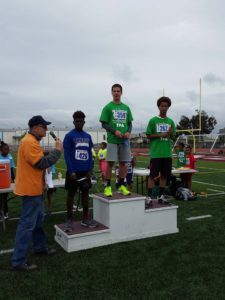 May 7th, 2016: The San Leandro Sports Foundation (SLSF) is hosting its 3rd annual Citywide Youth Track and Field Meet on Saturday, May 7th at the Pacific Sports Complex/Burrell Field in San Leandro. The purpose of the event is to provide our grade school students with a fun, healthy outdoor exercise and to raise funds for Sports/PE/Wellness/Fitness Programs in K-12 grades in the San Leandro Unified School District (SLUSD). 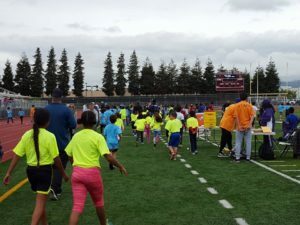 The iconic community event started in the late 50’s and provides an opportunity for thousands of our young student athletes to participate in a big, fun, healthy event that brings together grade schools students from all over San Leandro to learn to compete as friends and athletes. The event will be held at the brand new Pacific Sports Complex and Burrell Field. 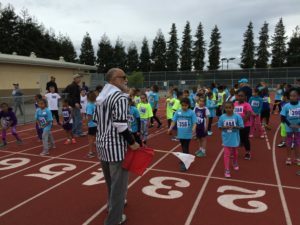 Register your student today at their school and come enjoy the fun and laughter as grade school students from around San Leandro run, jump and throw their way to victory. Sponsorship opportunities are available – Get involved in a great cause and generate goodwill for your organization.